Droughts, heat waves, reduced snowpack, winter storms and sea-level rise are all expected to intensify, driven by both natural weather patterns and greenhouse-gas emissions. 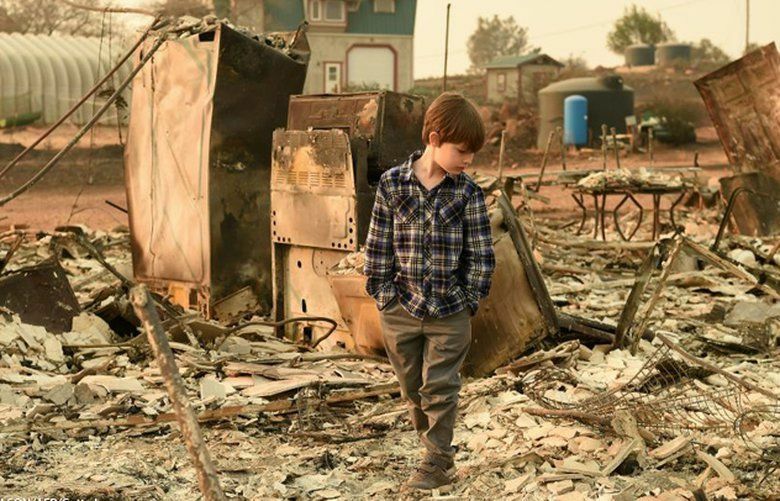 As portrayed in novels, the California of the future is barely habitable. Brutal storms alternate with crushing droughts. Mudslides and wildfires create waves of climate-change refugees. Fiction? Perhaps less so after the past week. California knows extreme weather. Throughout its history, it has endured natural disasters, like floods and heat waves. But many scientists say the wildfires of the past week are not completely natural. Park Williams, a Columbia University research scientist, said the fingerprint of climate change “is definitely there.” Daniel Swain, a climate scientist at the University of California, Los Angeles, agreed. “Increasing temperature plays a significant role in making these fires more explosive, and covering ground more quickly,” Swain said. 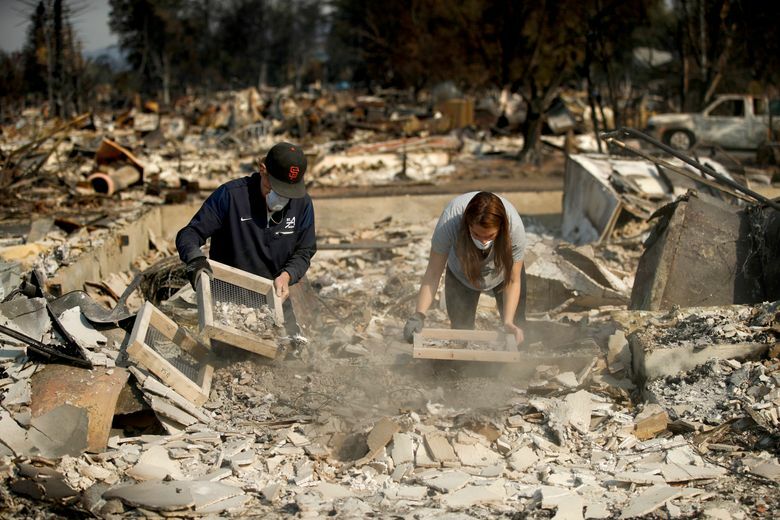 From April to September across Northern California, mean temperatures were the highest in 123 years, according to John Abatzoglou, a University of Idaho geography professor who grew up in California and specializes in wildfires and climate change. “Climate has enabled fire activity across the West this summer (and now fall),” he said in email. First the wet winter spurred robust vegetative growth. Then the record temperatures dried out that brush faster than in a “normal year,” he said. What is the new normal? For California, it is reflected in the weather patterns of past several years. Six years of drought were followed by record winter snow and rain, followed by record heat from April through September. Santa Rosa hit 110 degrees Sept. 1, a record high for the date. Five weeks later, parts of the city caught fire, destroying hundreds of homes and businesses. Worse extremes can be expected in coming decades. Droughts, heat waves, reduced snowpack, winter storms and sea-level rise are expected to intensify, say scientists who monitor climate change. How much will involve both natural weather patterns and levels of greenhouse-gas emissions that are building in the atmosphere, warming the planet? Sacramento and the Central Valley face risks on several fronts. The number of extreme-heat days — 104 degrees or higher — is expected to rise 6 to 10 times by the end of the century in cities such as Sacramento and Fresno, according to Cal-Adapt.org, a data collaboration involving the California Energy Commission, the University of California, Berkeley, and other partners. This year, the Northern California city of Redding baked under 72 days of 100 degrees or higher, surpassing the previous record of 69 days set a half-century earlier. Studies of past heat waves in California show they can cause hundreds of deaths in a single month. A 2009 state study of the July 2006 heat wave found that as many as 500 Californians may have died that month, and that each 10-degree increase in temperature from day to day led to a 9 percent increase in daily deaths. Swain, the UCLA scientist, said not every summer will produce record heat, just as every winter will not necessarily be dry. Sacramento’s delta breeze will still make a regular summer appearance, just as San Franciscans will bundle up in the June fogs. Under most climate-change projections, the Sierra Nevada will receive less snow, particularly at lower elevations. That will result in wildfires starting earlier in the season and extending longer, a pattern already documented. It also will heighten the risks for California’s mountain communities, such as Lake Tahoe and Mammoth. Sacramento and the San Joaquin Valley also confront the prospect of stronger winter storms, with more precipitation falling as rain instead of snow, increasing the flood threat. Projections show that Sacramento faces a 10 percent increase in storm size, with the San Joaquin receiving storms 50 percent larger, said Joe Countryman, a retired U.S. Army Corps engineer and flood-control specialist. Countryman said runoff could be moderated by big storms falling on ever-drier watersheds, where the dry ground could absorb much of the rainfall. But bigger storms striking already saturated slopes of the Sierra could create serious flooding, especially in the San Joaquin Valley, which doesn’t have the levee system to handle big flows. California has enacted the nation’s most aggressive laws to reduce greenhouse-gas emissions, and government and nonprofit groups are collaborating on ways to adapt to the changing climate. One of those is the Resilient by Design challenge, an effort in and around San Francisco to respond to sea-level rise and other expected impacts of climate change. Yet sea-level rise is one of the most challenging aspects of climate change to forecast. “It is one of these insidious things where uncertainty is not our friend,” Swain said. Until recently, scientists expected the Bay Area and coastal California to face gradual sea-level rise of 2 to 3 feet by the end of the century. But ice sheets in Greenland and Antarctica are melting faster than expected. “It is possible we could see 6, 7 or 8 feet (of sea-level rise) by 2100,” Swain said. With that kind of sea rise, Bay Area airports would be underwater, unless fortified by expensive sea walls. Freeways, residential neighborhoods and some Silicon Valley campuses would be threatened. Saltwater would intrude deeper into the Sacramento-San Joaquin Valley, rendering current water supplies undrinkable for more than 20 million Californians. This year’s hurricanes, flooding and wildfires should serve as a warning, said former Defense Secretary Leon Panetta, who leads the Panetta Institute at the University of California, Monterey Bay.